Curious about surfing reef breaks, but feeling a little intimidated? First, get Pipe and Teahupoo out of your mind – not every reef is for experts, there’s plenty of mellow, deep and fun reefs suitable for beginner and intermediate surfers! Put simply, at a reef break the waves break over a shallower area of coral or rock, rather than sand like at a beach break. As the wave breaks in a similar spot every time (and goes the same direction) it is more consistent. This makes it easier to progress your surfing as you can surf the same wave over and over again! Reef breaks will usually have a channel where waves won’t break. This makes for a much easier paddle out, plus somewhere you can sit to take a well-earned breather! If you’re surfing an offshore reef, you can get a boat to the waves – hardly any paddle out required! 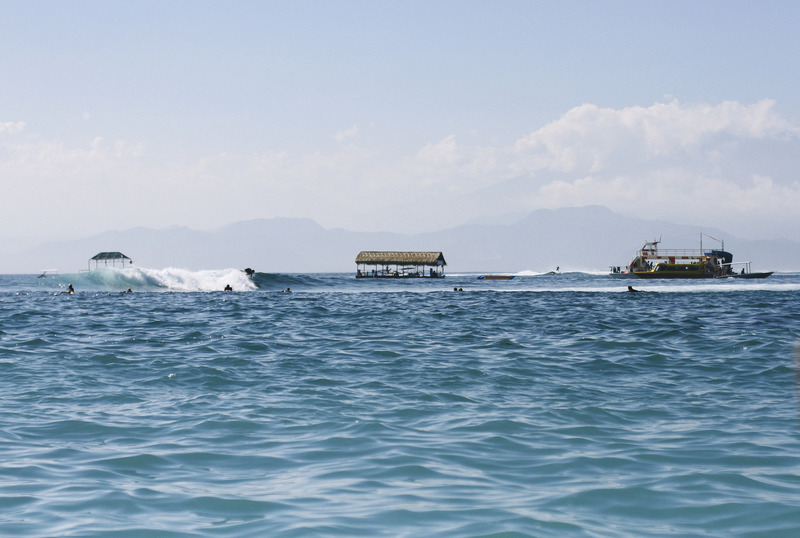 We love getting chauffeured to the waves by boat at Nusa Lembongan on our Bali trips. When you fall, fall as flat as you can with your arms and legs out wide (channel a starfish). This will stop you sinking down too far. It’s also a good idea not to dive in feet or head first for obvious reasons. Try not to kick down to get back on your surfboard. You can also invest in reef shoes – thin neoprene booties to protect your feet from scratches. You’ll be grateful for them if you graze the reef, especially if you’re surfing over coral. Watch from the channel to work out where to sit – this is crucial for reef breaks as the waves jack up more suddenly when they hit the reef, giving you much less warning than beach breaks. Tides are also important – they’ll affect how shallow the reef is so time your surf carefully! Amped to try surfing reef? Then join us in Bali where we surf over forgiving reef breaks suitable for beginners and intermediates. Whether it’s your first time surfing reef, or you just want to increase your confidence, our instructors will be by your side to make sure you’re in the right spot, explain how the wave works and point out any hazards.